Are you looking for a quiet hair dryer that does not irritate others around you? Using a hair dryer every day is something most of us do but a loud hair dryer can not only irritate you but can also disturb others around you. Quiet hair dryers do not lag behind normal salon hair dryers in any parameter and are designed to reduce the noise that a normal hair dryer makes during operation. They work in a similar way as other hair dryers with an added advantage of the quietness. Powered with an 1875-watt motor, this hair dryer from Hot Tools has a lightweight and compact design with three heat and three speed settings. The dryer also has a cool shot button for a boost of cold air. It gives you a powerful airflow without creating a lot of noise and comes with a cord of 8 feet for ease of use. The lightweight design reduces stress on the wrists and arm if drying long hair. There are three bonus attachments included with the model that include a pik, a finger diffuser, and a concentrator. The dryer is suitable for all hair types and reduces hair damage in the long run. The price of the dryer is high as compared to other models. The dryer has a very compact and lightweight design that reduces arm strain. The motor functions very quietly and dries all lengths of hair in just a few minutes. The 8-ft cord and the conveniently located buttons make it easy to use the dryer. It does not cause any significant hair damage with three heat and speed settings. The price of this hair dryer is higher than some other models. It does not dry thick and long hair easily without turning on the highest setting. This hair dryer from Hot Tools has a very quiet yet powerful motor and is very easy to use on all hair types. It comes with a convenient design and the heat and speed settings with a cool shot button add to its advantages. A very compact wall-mounted hair dryer, this model from Andis is very popular for its design and features. It comes with a 1600-watt motor and four heat and speed settings in total. A unique feature of this hair dryer is that it shuts off automatically when it is returned to the wall holder. This dryer has a very compact design and is great for short to medium hair but it will take some time to dry thick and long hair. The cord of the dryer is also long enough for ease of use. The price is very affordable as compared to its quality and you can get this dryer at a discount online. This hair dryer is one of the most compact and lightweight hair dryers among all models. The 1600-watt motor produces very low noise and dries hair quickly. The dryer shuts off automatically when it is returned to the holder. It comes at a very affordable price and is great in terms of quality. The dryer does not create a very powerful airflow to dry hair faster. The dryer takes more time to dry long and thick hair. It is very compact hair dryer than will be suitable for small spaces. It works well for its motor capacity and dries hair in just a few minutes. The quiet operation and the auto shut-off feature is great for drying your hair without any risk or noise. A dryer designed to reduce noise, the Centrix Q-Zone dryer comes with a 2-speed motor and a concentrator. There are two cool shot positions on the front portion and the back portion and the dryer is made using ionic technology that helps in better heat distribution for quick drying. It is a very quiet hair dryer and functions without making any noise. The buttons are situated at a convenient location and the handle is long enough to operate the dryer without disturbing the settings. It comes with a concentrator and is very lightweight. The price of the dryer is higher than most brands but it gives a salon finish to the hair. It is one of the quietest hair dryers available in the market. Ionic technology helps to dry the hair quickly and promote even heat distribution. The dryer has two cool shot positions that help to give a professional finish to the hair. The motor creates a powerful airflow despite having a 1500-watt motor. The price of this hair dryer is very high. The motor does not produce enough heat to dry very wet hair totally. This is one of the quietest hair dryers you can get as it produces very little noise that does not disturb anybody else. The powerful motor and the luxurious design make it worth the high price. If you are looking for an affordable hair dryer, this model from Revlon is worth considering. It has a lightweight and unique fan design for creating less noise and u-shaped air inlets that help in heat distribution. The dryer comes with a long cord of length 60 inches which is sufficient and easy to use. The size of the hair dryer is a bit large so it is not very suitable for travelling purposes. The noise generated by the dryer is very less and it is suitable for people who want a really quiet hair dryer for routine use. The price of the hair dryer is reasonable as compared to its unique design. The U-shaped air inlets of the dryer allow quick drying of hair. The length of the cord of the dryer is 60 inches which makes it easy to use the dryer. It generates very less noise of 5-7 decibels only. The dryer comes at an affordable price and is quite sturdy and durable. The size of the dryer makes it unsuitable for travelling purposes. The buttons of the dryer are very sensitive and can get accidentally pressed while using the dryer. 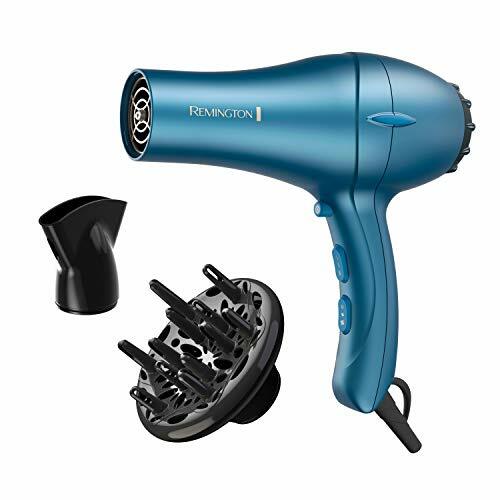 This hair dryer from Revlon is an affordable option to consider if you are looking for a quiet hair dryer with great airflow. It dries hair quickly and has a convenient design with a long cord for ease of use. Powered with a 1875-watt motor, the Ion Whisper Ionic hair dryer is very lightweight and is made using the tourmaline ionic technology for controlling frizz. It comes with a cool shot button for setting the hairstyle and a removable lint filter also. You can choose between 4 temperature settings and 2 speed settings according to your hair type and preference. A diffuser and 2 concentrators are also included with the dryer which can be used to create more volume and shine. The price of the hair dryer is moderate but the quiet operations and the powerful performance make it worth it. The dryer is very quiet and comes with a powerful motor for drying hair quickly. It reduces frizz and enhances the shine when used on sections of hair. The removable lint filter and extra attachments make it easy to clean the filter. The temperature and speed buttons are located conveniently for easy control. The price of the dryer is a bit higher than other models of similar configurations. It is not as quiet as a whisper like the name suggests. If you are looking for a powerful hair dryer without the noise, this dryer is worth the investment as it comes with many attachments and settings that can be personalised for your hair type. 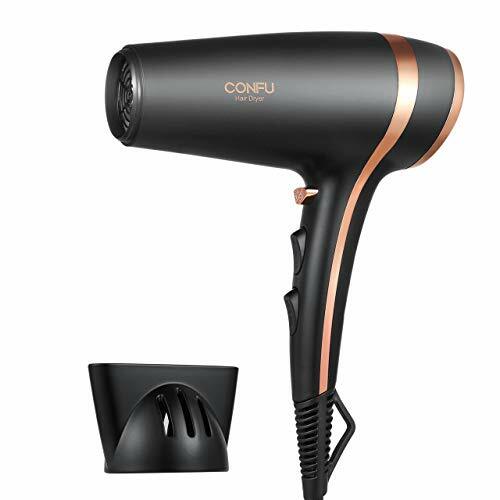 Conair is a well-known brand when it comes to hair styling tools and this dryer from the brand is available in three classy colour options. It is designed using a patented noise reduction technology that reduces noise significantly. A brushless motor powers the dryer and creates 70% more airflow to dry the hair quickly. The ionic technology controls frizz and enhances the shine of the hair. Three heat setting buttons and 1 cool shot button make it convenient to adjust the temperature and speed of the dryer. The price of the dryer is high but you can get it at a great discount online. It is available in three stylish colour options and has a sturdy design. The powerful brushless motor creates a strong airflow without adding to the noise. The ionic technology with three heat settings make this model suitable for all types of hair. It offers an option to switch off the ionic feature. The price of this hair dryer is high as compared to its features. The model is a bit heavier than other hair dryers available in the market. This hair dryer from Conair looks very stylish and delivers a powerful performance while controlling the noise. It controls frizz significantly and makes the hair look lustrous from the first use itself. If you can stretch your budget to invest in a great hair dryer, this model from Bio Ionic can be a great option for people with frizzy and unmanageable hair. It might seem expensive but it is made using nanolonic mineral that hydrates the hair and reduces frizz. The dryer comes with a 1400-watt motor that cuts down on the drying time significantly and makes the hair look more natural. This model is very quiet while usage and comes with a cool shot button as well as a cool temperature setting. The design is such that it is convenient to hold the dryer at all angles. The price is higher than most hair dryers available in the market. It makes the hair look manageable and lustrous with nanolonic technology. The design of the hair dryer is lightweight and buttons are conveniently located. It dries hair very fast and is one of the quietest hair dryers you can purchase. The temperature settings offer a cold temperature setting as well. The dryer is one of the most expensive models available in the market. It is not a very travel-friendly hair dryer as the size is big. This dryer might seem expensive but it can make your hair look more healthy and glossy with its nanolonic mineral technology. It is very quiet and can dry your hair faster than most other hair dryers available in the market. An affordable hair dryer from Remington, this professional titanium hair dryer is not only a quiet hair dryer but also delivers a professional finish. It comes with a concentrator and diffuser attachments and comes with a cool shot button for reducing frizz. There are three speed and two heat settings for temperature control. It works well for fine and short hair too. The length of the cord of this dryer is a bit shorter than other models. The dryer has a titanium ceramic design that reduces damage to the hair significantly. The price of the dryer is affordable. The dryer makes the hair feel softer and more manageable. It offers three speed settings and two temperature controls including a cool shot button. The powerful motor dries the hair quickly without making a lot of noise. The titanium ceramic coating reduces hair damage even with frequent use. The length of the cord is a bit smaller than other hair dryers available in the market. It is not as quiet as other hair dryers. This affordable hair dryer from Remington dries the hair very quickly without causing any damage. It makes the hair feel smoother and allows the user to customize the settings according to the hair type. Made with an exclusive MuteDry technology to make the dryer work noiselessly, this model from Confu comes with an 1875-watt motor and a concentrator nozzle. The dryer has a lightweight design and is compact enough for travel as well. The 2 speed and 3 heat settings with a cool shot button work well for all hair types. The length of the cord is 8 feet and the fan of the dryer has 7 blades for creating a powerful airflow. It comes with an auto shut-off feature as well for additional safety. The price of the hair dryer is quite affordable and it is one of the cheapest quiet hair dryers available in the market. The MuteDry technology cuts down noise by up to 15% as compared to regular hair dryers. It is travel-friendly and has a lightweight and durable design. It comes with an auto-shut feature and a 7-blade fan for a powerful and safe performance. The price of the hair dryer is very affordable. The dryer creates only 15% less noise than other hair dryers. The buttons are located at sensitive positions and can get turned off accidentally. It is a powerful yet quiet dryer and has all the features that expensive hair dryers offer at a much higher price. The heat and speed settings along with an auto shut-off feature make this dryer worth the affordable price. 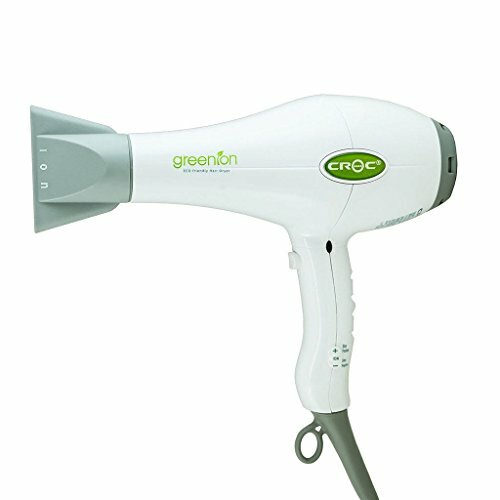 A powerful hybrid hair dryer that is also eco-friendly, the CROC hybrid blow dryer is a bit expensive but has many features to offer and is made using the Greenion technology. This technology uses natural hemp powder that reduces CO2 emissions and status electricity. The dryer comes with a silent fan and a dual housing that makes it quite durable. A removable diffuser is also included with the dryer for an even airflow. It dries the hair very quickly and makes significantly lesser noise as compared to other dryers. The price of the dryer is high but the hybrid technology and eco-friendly design make it worth it. The dryer is made using Greenion technology that uses natural hemp powder instead of plastic sources. It reduces static electricity and makes the hair look smoother and shinier. The quiet fan and the dual housing design provided added comfort and durability. The removable diffuser promotes a strong and even airflow. The price of this hair dryer is higher than most other models. It takes some time to dry long and thick hair with this dryer. This hybrid hair dryer is not only great for drying your hair but is also good for the environment. The Greenion technology reduces static frizz and leaves the hair looking glossy and smooth. Quiet hair dryers can often come with less powerful motors in order to control the noise but this also leads to an increase in drying time and less powerful airflow. Look for a quiet hair dryer that comes with a 1500-1800 watt motor for getting adequate airflow and powerful performance. Some quiet hair dryers that claim to be quiet produce as much noise as regular hair dryers so it is advised to read more about the product before investing in it. A quiet hair dryer should product at least 20-30% less noise than a normal hair dryer otherwise it makes no difference when used for drying hair. Anything less than sixty decibels can be considered as quiet when it comes to hair dryers. Check the heat and speed settings offered by the model as these settings are very important for using the dryer on different hair types. Most quiet hair dryers offer 2-3 heat settings and 2 speed settings as well along with a cool shot button for finishing the styling. The buttons should be located at a convenient location and should not get accidentally turned off or on while using the dryer. The cord length of the dryer should be at least 6 feet for ease of use and functionality. Some dryers come with a very short cord that makes it difficult to use the dryer for long hair. You can get a good quiet hair dryer in about 30$ to 200$ depending on its technology and brand. Some hair dryers come with special noise-reduction technologies that can make them more expensive as compared to other simpler hair dryers. Do not buy very cheap hair dryers which can catch fire easily due to poor construction and cheap plastic raw materials. A heavy hair dryer can make it very uncomfortable for the user to dry hair regularly. Go for a lightweight model that is sturdy enough for regular use as heavy dryers can make your arm feel tired if you dry long and thick hair. Since hair dryers are not brought frequently, it is important to invest in a model that is durable and can last for years if used properly. Sturdy hair dryers last for a long time and some models can break even if they are dropped accidentally. An additional removable diffuser or a concentrator can help you dry your hair with a better and even airflow so these attachments should also be given some importance. A few models also come with a removable lint filter that makes it easy to clean the dryer after a few uses. Reading customer reviews of a particular hair dryer model can help you get a genuine idea of how the product works and whether it is actually quiet or not. Users who have used the product and know about its features and drawbacks share these reviews so they are quite helpful. Q: Can a quiet hair dryer be as powerful as a regular hair dryer in terms of airflow? A: Quiet hair dryers are generally designed to control noise and have a less powerful motor as compared to regular hair dryers. This is a simple principal as motors that are high in capacity produce more noise. Most quiet hair dryers produce more or less similar airflow as regular hair dryers but some models are less powerful than regular dryers. Q: Which is better Ceramic or tourmaline drying technology? A: Both types of hair dryers use infrared heat to dry the hair but tourmaline hair dryers are gentle on the hair and reduce frizz. You can go for either type of hair dryer depending on the model and its features as both technologies are suitable for everyday use. Q: How many decibels does a quiet hair dryer work on? A: Any hair dryer that functions on 50-60 decibels is considered quieter as compared to regular hair dryers that produce around 80 decibels of noise. Quiet hair dryers are better for the body as well the environment as they create less noise pollution. Q: Can I use a hair dryer everyday on my hair? A: You can use a hair dryer on your hair everyday if you choose a low heat setting which does not cause any damage to the hair with regular use. Using high heat on the hair without any heat protection can damage and dry your hair so it is better to use a hair dryer sparingly. Q: Can a hair dryer damage your hearing? A: Yes. Loud hair dryers can damage your hearing over time if used regularly. Therefore, it is advisable to use a quiet hair dryer for regular hair styling sessions to prevent any damage to your hearing. Quiet hair dryers do not disturb others around you as well which is an added advantage. Q: How do I stop my hair dryer from overheating? A: Using the hair dryer for small time intervals before switching it off and then starting it again can prevent your dryer from overheating. Using it on a lower heat setting can also prevent this situation. Hair dryers with an auto shut-off feature can also make the hair dryer safer and prevent overheating. Do not use a hair dryer on very wet hair. Let your hair dry a bit naturally before drying them with a quiet hair dryer to get better results. Turn off the hair dryer when not in use or between drying sessions to prevent the motor from overheating. Use the cool shot button at the end of the drying session to give a natural and shiny finish to the hair. Go for a hair dryer that comes with a concentrator and a diffuser as these attachments can help in even heat distribution. Use a heat protectant on your hair before using a hair dryer for added heat protection and enhancing the shine. Avoid buying a hair dryer that promises to be extremely quiet as these dryers can be low in terms of power output and will create a weaker airflow. Wall-mounted hair dryers are suitable for smaller spaces where the space on the vanity is lesser so go for these quiet hair dryers if you are short on space. Pay attention to the wattage of the hair dryer you are considering to purchase as there is no use of a quiet hair dryer if it cannot dry hair quickly with a powerful airflow. Pay special attention to the location of buttons on the handle of the dryer as inconveniently located buttons can be a little difficult to operate while using the dryer. Clean the hair dryer regularly by removing the lint filter or wiping it with a clean dry cloth to prolong its durability and life. Make sure that you do not drop the hair dryer from a height as most hair dryers can break under the impact or can get damaged beyond repair. So this was the list of top ten quiet hair dryers available in the market which provide the same powerful performance at a significantly lower noise level. These hair dryers are perfect for home use as they can be used without waking up the baby or disturbing your partner. They are also better for the environment and are as powerful as regular hair dryers when it comes to airflow and drying time. This detailed buyer guide and FAQs will help you find the right hair dryer for your hair styling sessions. Have you used a quiet hair dryer? How was your experience? I want to know what decibels is suitable for hearing? A loud sound is 69 decibels which is acceptable for some people with higher level hearing but the normal is 30-40 decibels that is acceptable. However, the louder noise makes the more stress level. I want to know if my hair dryer can damage hearing? The noise 80-90 decibels is very loud and can damage hearing. The middle sound is 50-60 decibels which is better than 80-90 decibels but still loudly and affect hearing. However, I recommend you to use 30-40 decibels that is acceptable for hearing. I’m falling in love with Centrix Q-Zone Dryer. It’s quite low noise. CROC Hybrid Blow Dryer appeals to me. I love this. Hi Jenny. BIO IONIC Whisper Light Pro-Dryer works very well as you suggest. Thank you.